In the northeastern US, human encounters with wildlife (such as coyotes and bears) have been on the rise over the past several decades. Though these encounters indicate growing wildlife populations, they also pose challenges for wildlife managers, pet and livestock owners, and those who leave their birdfeeders out too long in the spring. Here in northern India the consequences of encounters can be more dramatic than a missing sheep or mangled bird feeder. When we first moved into the guesthouse at the Himalaya Public School in Chaukori, were were escorted from the school buildings to our room each evening after dark, a distance of only a few hundred meters. When we asked why, we were told that there are safety concerns because of leopards (Panthera pardus). Initially, we were skeptical that there was much of a threat as the area doesn't appear particularly wild and we hadn't seen any leopards or leopard sign. 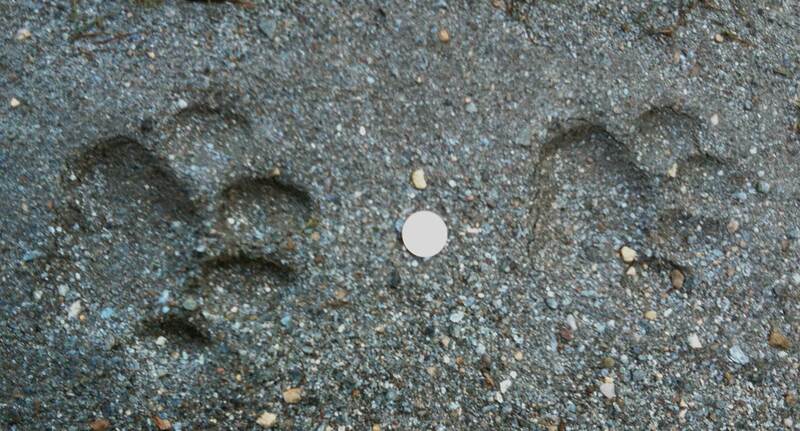 Eventually however, when our friends Jay and Robert were visiting, they discovered fresh leopard tracks one early morning in the sand and mud along the road near the school. 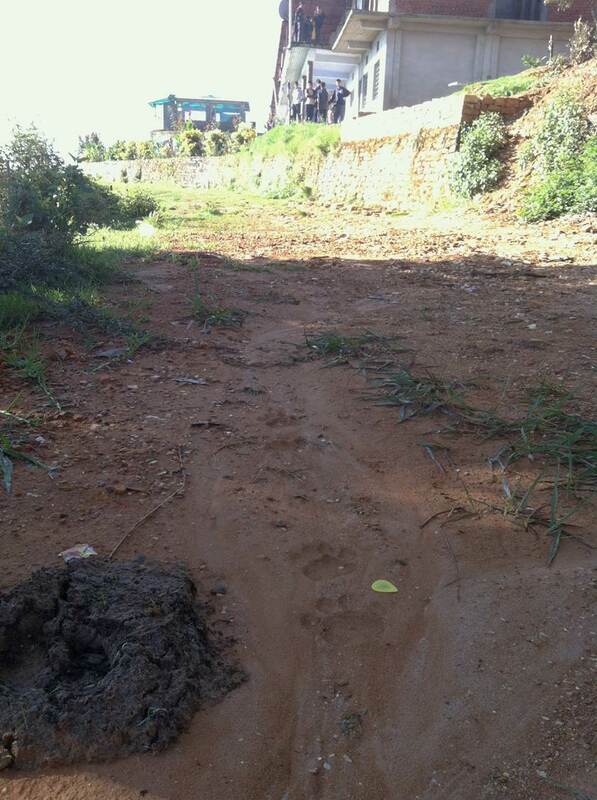 Though the tracks weren't particularly large (probably not from a full-grown adult), here was clear evidence that leopards are alive and well in Chaukori. In fact, this particular cat must have walked right by the school and is probably the same one that Jay saw moving in the shadows along the edge of a hedgerow the previous evening. We've also learned that leopard sightings are fairly common along the roads near Chaukori in the early mornings and late evenings. The explanation for the large leopard population in an area that includes more agricultural land than wilderness has to do with the abundance of prey in the form of dogs and cows . . . and yes, there are plenty of dogs and cows (some of them stray and unattended) in the area around Chaukori. That leopard encounters can be dramatic and deadly became all too clear to us when we learned that in September, two children (ages 4 and 6) were killed by a leopard in the village of Berinag, about 15km from Chaukori. Here in Munsiyari, we're living in a more remote area along a mountainside that extends up above treeline to alpine meadows and down to the subtropical zone along the Gori River. Not surprisingly, wildlife is more abundant, and there are more stories of threats to people and to livestock and crops. 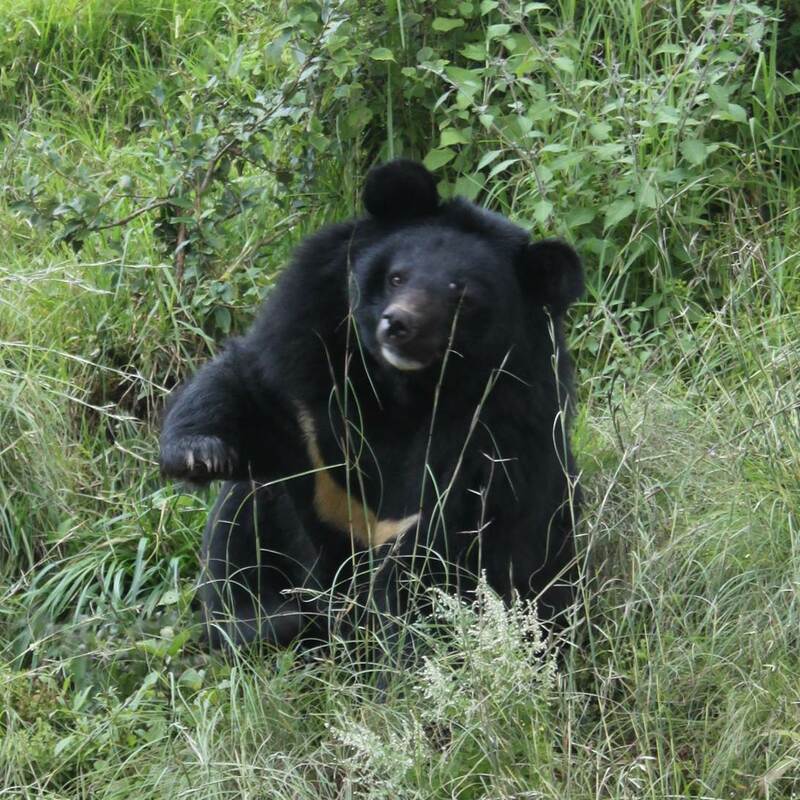 Perhaps the most dramatic species that can be found right in our "neighborhood" is the Himalayan Black Bear (Selenarctos thibetanus). This species is in some ways similar to the American Black Bear, but apparently somewhat larger and more aggressive. Though these bears don't seek out humans, it can be dangerous to surprise one. A couple of years ago a local woman was out cutting hay when she surprised one. Luckily, she was able to slow its attack with her sickle and escape only having lost a few fingers. Recent word is that at least one bear has been coming down to the outskirts of the village where we live and people don't walk alone or quietly (singing can be a good idea) at night or dusk or dawn. Another species that has been harassing our friend Malaka's hens and geese is the jackal (Canis aureus). Though not a threat to humans, several have been stalking her flock in broad daylight, and one was spotted on her henhouse mid-afternoon a couple of weeks ago. Less menacing, though still "pests" from a farmer's perspective, are langurs (Presbytis entellus). These monkeys are quite common along the roads, in the fields and in the forests around here. We see them on an almost daily basis. Of course we find them wonderfully entertaining, but they do like to raid farmers' crops and are often chased away by stone throwing children or adults. A langur in Nainital. 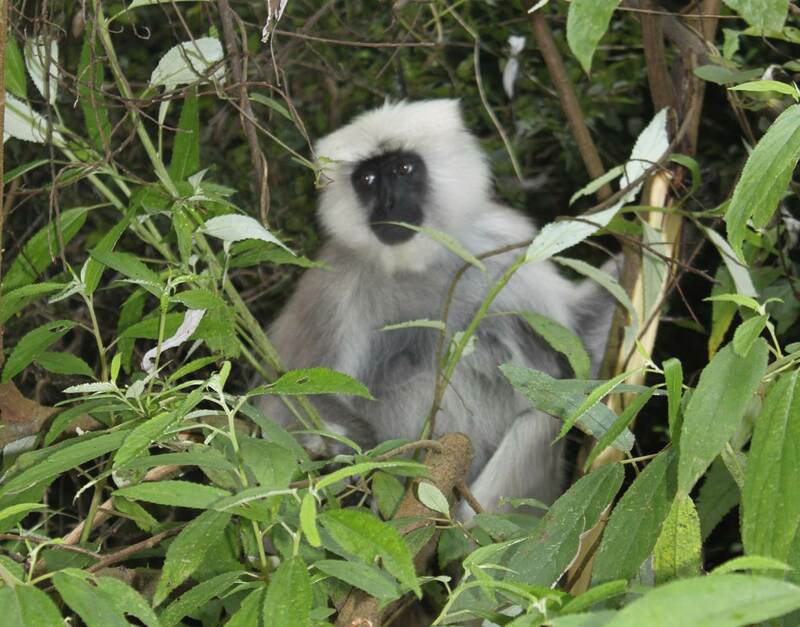 Though we see langurs almost daily in and around our yard in Munsiyari, it's tough to get a clear closeup because they don't sit still when approached. I could go on about other wildlife "pests," such as porcupines (Hystrix indica) that like to raid vegetable gardens, but instead I want to end by calling attention to the diversity of wildlife species that occur in this relatively small area. Because of the incredible topography and range in altitude, we're living within a day's walk of permanent snow and subtropical jungle and all of the various life-zones and habitat types between. 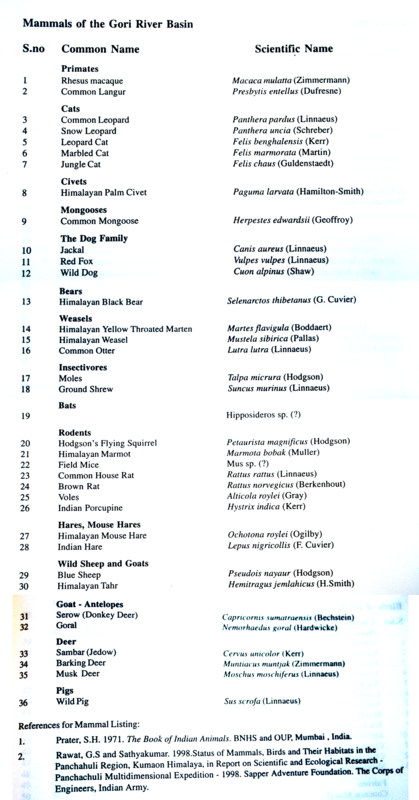 As a result, the Gori River Basin includes a wide diversity of mammal species, such as five different wild cats, including the lowland jungle cat (Felis chaus) and the elusive snow leopard (Panthera uncia). Though in Munsiyari the details are different, just like in the northeastern US, a big challenge for the future is to continue to find ways to live alongside these amazing creatures. The Gori River Basin (where Munsiyari is located) is a 120km long, 25km wide area between 75o45' and 81o5'E Longitude & 29o5' and 30o10' N Latitude. 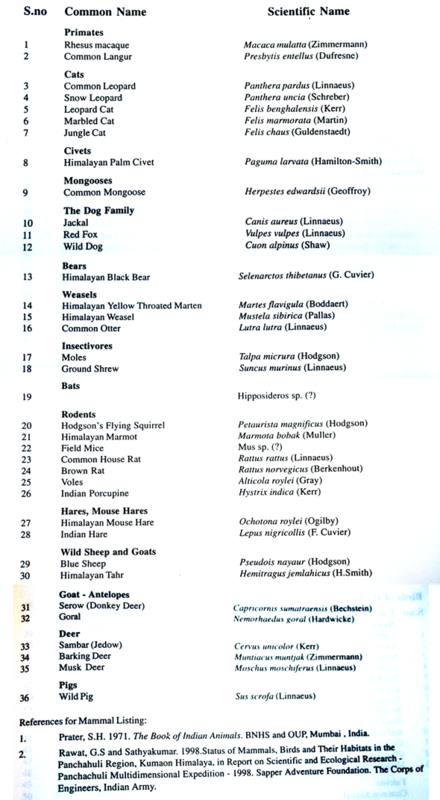 A Biodiversity Log and Strategy Input Document for the Gori River Basin, Western Himalaya Ecoregion, District Pithoragarh, Uttaranchal (now re-named Uttarakhand). By The Foundation for Ecological Security, July 2003.